As soon as I got this book in the mail, my kids absconded with it and I eventually had to go hunt it down so I could read it. I'm not complaining though, because I love how excited they get when a review book comes that they can read. Gordy and his friends were fun to get to know, although Max could be a little on the annoying side at times. 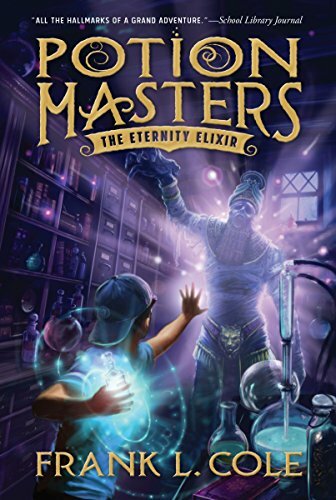 Potion Masters has an interesting story line, sort of reminiscent of Harry Potter, although the similarities end with the whole "secret magical society" part. In future books, I would like to see more of Gordy balancing his life as a regular kid and a potion master. In this story, we don't see much outside of his home life. This is a quick read, and something that is enjoyable for everyone from Elementary school through adulthood. Honestly I wasn't sure what to expect from this book. Middle grade fiction is either hit or miss with me, but since I'm a cover snob I thought this one looked interesting. It was a fun read. I like delving into a whole different world. That being said I would have liked a little more information about this world. Mixing potions wasn't at all like I was thinking, and we just get thrown into it. I'm not sure an elementary student or middle grade student would care though. They would probably just enjoy the ride that we get to go on with Max and Gordy. One more minor thing. I hate when the parents of these kids are portrayed as stupid. And while that wasn't necessarily the case in this book, I wish the dad would have been a little more....less out of it. I mean, I know he wasn't in the whole potion thing, but when everything goes down he kind passes responsibility onto Gordy. This ended well, but was nicely set up for a sequel, which I will happily read. While I was reading it my kids took a look at it and asked me if I liked it because it looked good. I can't wait to have them read it and tell me what they think.